Whether an idea for a startup or new product or service offering at an existing company, the following is a framework I use to evaluate new business opportunities. Usually, the truth is that we aren’t deciding between pursuing one opportunity or not; rather there are multiple opportunities available to us and we must prioritize which opportunities are best to pursue. To do this, our goal ultimately is to stack rank the new opportunities by quantifiably answering the following two questions: 1) the business value we could expect to gain and 2) our ability to execute on these opportunities. If there is only one opportunity available to evaluate, the process is simplified such that only opportunities with positive net business value and reasonable ability to execute are pursued. The challenge with this framework will be establishing the acceptable level of ability-to-execute beyond which you will choose to execute on the opportunity. 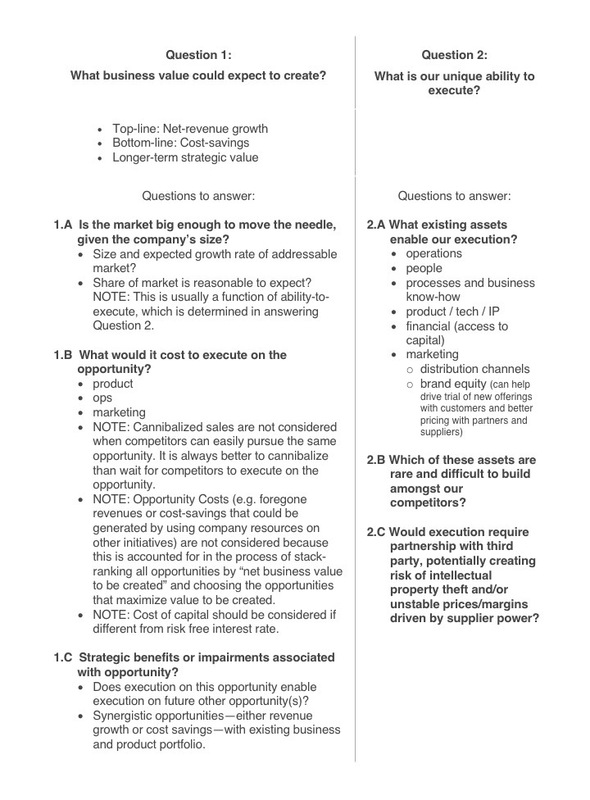 This entry was posted in business innovation, business strategy, entrepreneurship by Jason. Bookmark the permalink.